NEW YORK--(BUSINESS WIRE)--Today, the Partnership for New York City released a report that summarizes the many accomplishments of its $160 million investment arm since it was established in 1997 by the leaders of the city’s business community. The report, “Partnership Fund for New York City: Twenty Years of Investing in a Stronger, More Inclusive New York,” describes how the Fund has helped create 39,000 jobs, provided $70 million in financing to projects developed by nonprofit organizations, minority and women entrepreneurs, and invested $53.8 million in high-tech startups and accelerator facilities that fueled the city’s innovation economy. The Fund was established by corporate and individual members of the Partnership for New York City who contributed at least $1 million and volunteer their expertise and other resources to support portfolio projects and companies. As an evergreen fund, all returns are reinvested in worthwhile projects and key growth sectors of the local economy. 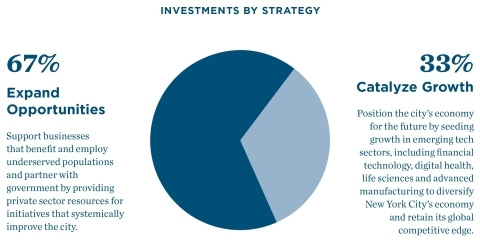 Two-thirds of the Fund’s investments have been dedicated to expanding opportunity, like bringing Citi-Bike to lower income communities, Grameen America’s microenterprise lending program and the shared industrial facilities developed by the nonprofit Greenpoint Manufacturing and Design Center. The other one-third of investments have been in projects that are catalysts for growth and diversification of the city economy. The Fund has sponsored major programs to strengthen the city’s industry clusters and to develop new sectors of business activity in financial technology, digital health and life sciences. It was a pioneer in the development of digital media and e-commerce startups in the first generation of Silicon Alley and subsequently supported early activity in cleantech, artificial intelligence and advanced manufacturing. “The Partnership Fund was an idea that I developed with Jerry Speyer. The point was to put the expertise of the city’s business community to work on projects that would expand and diversify the local economy. Since we launched in 1997, the city has gained over a million jobs and the economy has grown by 136 percent. The Fund has made a significant contribution to New York City’s success story,” said Henry Kravis, Founding Chairman of the Partnership Fund and Co-Chairman and Co-CEO of KKR. “The Partnership Fund is equal parts economic development and social investment. The city cannot succeed without extending economic opportunity to all New Yorkers across the five boroughs. We have deployed much of the Fund’s capital and expertise to support projects that advance neighborhood revitalization, education and workforce development,” said Chip Kaye, Co-Chairman of the Partnership Fund and Co-CEO of Warburg Pincus. “As a private fund with a civic purpose, we have the flexibility to take big risks on investments that others will not make. We’re helping entrepreneurs get a foothold in the world’s most competitive market and seed funding sectors that hold long-term promise for the city’s future, such as life sciences and advanced manufacturing,” said Tarek Sherif, Co-Chairman of the Partnership Fund and Chairman & CEO of Medidata. “As the innovation economy continues to upend traditional business models, the role of our Fund network of industry experts and innovators is more important than ever. As we have for the past 20 years, the Fund will continue to invest in projects that make New York’s economy more resilient, more accessible and more inclusive,” said Maria Gotsch, President & CEO of the Partnership Fund for New York City. The Partnership Fund for New York City is the $160 million investment arm of the Partnership for New York City, New York’s leading business organization. The Fund’s mission is to engage the City’s business leaders to identify and support promising entrepreneurs—in both the for-profit and nonprofit sectors—to create jobs, spur new business and expand opportunities for New Yorkers to participate in the City’s economy. As an “evergreen” fund, realized gains are continuously reinvested. The Partnership Fund Board is led by Co-Chairmen, Charles R. Kaye and Tarek Sherif. Maria Gotsch, President and CEO, leads the team.